By choosing these galvanized landscape, gardening, and sod staples, you won’t have the problem of rapid rusting that other buyers experience when they buy inferior non-galvanized staples. High quality, USA-Made products like these 6” galvanized garden staples are a joy to work with. And, because they’re galvanized, they’ll last much longer without getting rusty, and they’ll keep doing the job they were intended to do. Because they’re also manufactured to exacting standards, they’ll always be the right size and you know that you’re getting a USA-Made high quality product at a great price. You also know that your satisfaction is guaranteed, and if you’re not totally satisfied with what is shipped to you, you can either return it for a full refund or just request a replacement. In either case, you’ll be happy. These staples are perfect for holding down sod or landscaping fabric on hills, mounds, and curves, anchoring wire to the ground for plant and animal cages and even fences, for use with garden ornaments or decorations, for installing and securing landscape edging, water and drip soaker hoses, and much more. GALVANIZED STEEL (BEWARE OF DISAPPOINTING RESULTS FROM OTHER PRODUCTS) - don't be disappointed by rusting staples. If you buy anything other than galvanized steel, they will rust quickly. Just read the 1-star reviews on non-galvanized products from other brands, and you'll see how disappointing they can be. You can't re-use garden your landscaping staples or spikes if they've rusted to pieces, and worse yet - once they've rusted, they will stop doing the job that you need them to do. MADE IN THE USA - we offer a great value product that just happens to be made in the USA - which means you support local employment, local industry and local manufacturing, instead of supporting a manufacturer and an industry in a foreign country. But, we don't expect to win your business just by being USA-Made - we also know that we need to offer a great quality product at an unbeatable value, and we think we do that very well. CORRECT SIZE, EVERY TIME - the unique manufacturing process used to make these staples means that each piece is the correct size, each and every time. Combine that with the fact they're galvanized 11-gauge wire, and you've got yourself a top-quality pack of USA-Made landscaping and garden staples. 100% HAPPINESS GUARANTEE - your satisfaction is guaranteed when you buy this product. 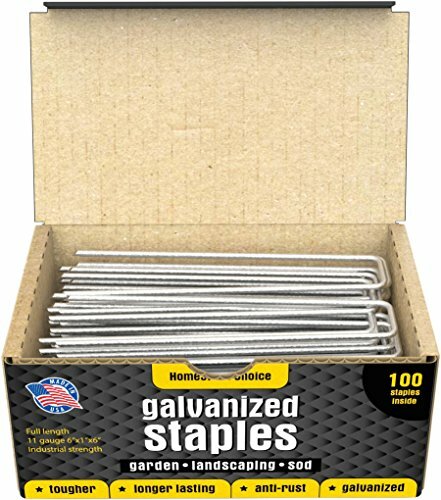 By choosing galvanized landscaping and garden staples, you're not only guaranteed to be happy with your order, but they're also going to last much longer once installed than inferior non-galvanized staples might last. However - if you're not satisfied with what is shipped to you, you can either return it for a full refund, or just request a replacement. In either case, we'll make it right, and you'll be happy. If you have any questions about this product by Homestead Choice, contact us by completing and submitting the form below. If you are looking for a specif part number, please include it with your message.